This week began with a holiday to remember a champion of human connection. Dr. Martin Luther King, Jr. told us that he had, “A dream that my four little children will one day live in a nation where they will not be judged by the color of their skin, but by the content of their character.” Dr. King truly wanted each of us to be recognized for ourselves. 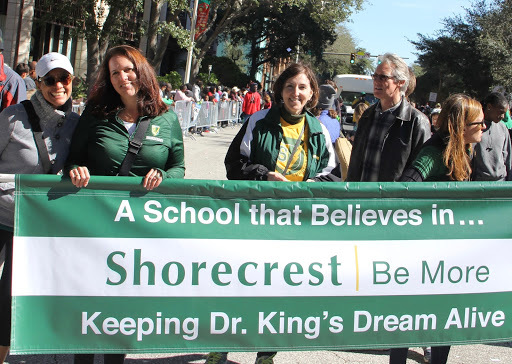 At Shorecrest Preparatory School in St. Petersburg, Florida, the faculty and student body honored Dr. King by participating in the city’s annual parade. Shorecrest's acknowledgement of Dr. King's ideals isn’t something that only happens once a year. Events throughout our school year continually remind our students to practice building connections with the broader community. One of those events is Service Week in our Upper School, it is a week of outreach that teaches our high schoolers how to build connections across cultural boundaries. Below, is student Lily Schneider’s reflection on what she learned that cannot be taught in a classroom. It is a powerful document of personal growth, and a glimpse into the fullness of life that can be achieved, when balance and excellence of character are nurtured alongside academics. We invite you to to schedule a personal tour and learn more about Shorecrest's mission and see our commitment to producing well rounded students in action. I wasn’t sure what to expect on our trip to one of the most remote and forgotten places in our country. I have some friends that I met previously to the trip at a summer camp I attended years ago. These friends are from Native American reservations in Arizona, New Mexico, and South Dakota. My closest of these friends, Haylee Quick Bear, lives in South Dakota on the Rosebud Reservation, belonging to the Lakota tribe. I was lucky enough to see her again on this trip; I never thought I’d see her again after camp that summer because we live so far away, but fate had a plan to bring us back together. We had been planning our meet-up since we heard I was taking a service trip out West. Haylee had told me so much about her tribe, her home, and the reservation, but I could never picture the exact kind of lifestyle she lives. I felt beyond blessed to have the opportunity to go see her and the beautiful culture that lives there. 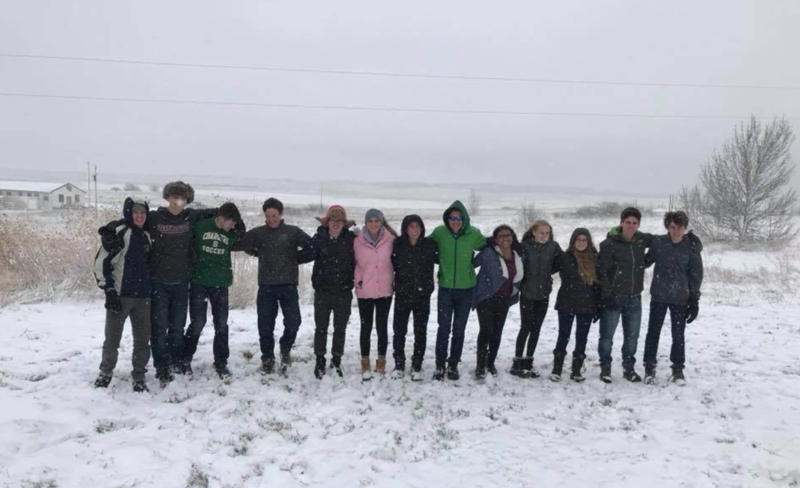 We drove up the steep, snowy driveway to a bright red cabin labeled “Re-Member.” All 14 of us Floridian students jumped out of the van and attempted to catch the snowflakes on our tongues as we brought our luggage inside the cabin via an assembly line. Dinnertime at the service cabin was something I’ll always treasure because it was centered around conserving food. Food, something that we often take for granted, was lacking on the Res. I remember taking a trip into “town” from the Res and seeing a deserted gas station, surrounded by nothing but grasses and occasional tumbleweeds, no joke. We entered the gas station, the only store in miles on the reservation. We saw the typical gas station snacks including beef jerky, chips, cookies, bottled soda, and gum. However, since this was the only store accessible to the people of the reservation, the store also needed to have the following products of which there was limited quantity of: feminine products, toiletries, water, and produce. The produce section of the store was in the very back, secluded from the rest, and only measured about 3 feet by 3 feet. The prices astonished me: $8 for a single orange, $10 for a couple carrots, and $6 for an apple. It was very upsetting to see the reality of the lack of produce in MILES of forgotten land. I took this to heart, and think of it often in my everyday life. Waking up to the colorful sunrise and sounds of traditional Native American music each morning was an experience I’ll never forget. It was so humbling to hear stories of Native American idols and how deeply their culture is treasured in their communities. We’d begin each morning with “Wisdom,” a time dedicated to listening to Native stories. These stories and the values given with them have stayed with me every day since. We made our way down the snowy path towards the working shed where we constructed bunk beds and outhouses for Native families in need. 90% of families living on this reservation are below the poverty line. This was the poorest county in all of America. We spent hours in the dusty woodshop, taking turns chopping wood and nailing boards together. After a few days in the shop, we were blessed to have the experience of actually delivering the beds to the families. Of course, we had to finish constructing the beds inside the house because of the size of them. While we screwed in the last couple screws, we had opportunities to get to know some of the younger children living in the house. They were shy, wearing ragged clothing, but had the biggest, brightest smiles when they saw their very first bed. And it wasn’t just the children who noticed this. Many of the parents were receiving their very first bed they’ve ever had. Previously, they were sleeping on the floor. The feeling I got when I was able to give someone the gift of comfortable rest was unexplainable. As we were driving through the empty reservation, we noticed about 6 minivans parked on the side of the road, all with individuals and their families packed in, setting up goods. Curious, we parked next to the vans and saw men, women, teenagers, and children all getting out of their vans. Some were smiling big, others were clearly stressed. Along the hoods of their cars were beautiful dreamcatchers, necklaces, earrings, purses, etc. Each craft was intricately made with glowing details and displayed Native American cultural values. Many crafts had the 4 colors: red, white, black, and yellow, representing the world’s people. Others had drawings of turtles, eagles, and horses, each with a story behind it. Seeing the kinds of poverty these people lived in made me want to buy everything; after all, their only sense of income was people like me buying their crafts. I had $20 in my pocket, and I was overwhelmed what to decide on. I made my way to each van, not necessarily to “window shop” the crafts, but to get to know the people. One woman I met had 4 kids in her beat-up minivan and explained to me how lucky she is, despite how little she had. This was life-changing for me. On the hood of her van, I saw a beautiful bright blue bracelet. I asked her the backstory of it, and she told me it was made of porcupine quills and ceramic beads, and she made it to honor her children, for they are the future of this community. I bought the bracelet for $15 without giving it a second thought. As I was walking back to our mission trip bus, my eye was caught on an original dreamcatcher. I knew I didn’t have enough money to buy it (I only had $5 left, and it was $20), but I was eager to just know more about it. So, I asked her questions about the meaning of it and its importance in Native American culture. The two of us talked for about 15 minutes about her day-to-day life and dreams when she told me, “beautiful girl, you are deserving of this dreamcatcher. Please just take it, on me.” I had never felt so connected with a complete stranger. A woman living with almost nothing in a van with her 4 children gave me one of her goods for free. I refused to take it, but she refused to let me walk away without it. To this day, my dreamcatcher hangs above my bed. It reminds me daily to be selfless and to not be afraid to connect with complete strangers.